Maqam al-Nabi Musa - Where Is Maqam al-Nabi Musa? Nabi Musa in Arabic means "the prophet Moses" who is recognized as one of the great prophets of Islam. Believed to be the spot where the prophet Moses is buried, Maqam al-Nabi Musa has been the site of an annual pilgrimage festival since the time of Salah Eddin. Set in an awe-inspiring landscape 8 km. south west of Jericho and 20 km. east of Jerusalem, Maqam al-Nabi Musa is a splendid example of medieval Islamic architecture. The present shrine, mosque, minaret and some of the rooms were built in 1269 AD while successive additions brought the site to its present day shape in 1475 AD. 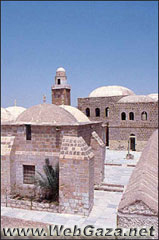 From Nabi Musa a track runs due west to the Byzantine cave monastery in Wadi Mukelik and continues on to Khan el-Ahmar.